Shirt of horrors! Spookily appeared at this time of year….take care in dark alleys in case people start pointing and mumbling something about mark of the beast…. He would glow in a dark alley, I think! Source of new tales of hauntings? He would never forgive me! Plus, then it would be even scarier! At first I just overlooked it and thought it wasn’t that much of an ugly shirt. The color is a bit too flashy but… And then, as I was reading, I started looking at the details. The artwork is terrible. The characters are so badly drawn (oh I accidentally typed “drown” at first, should have left that, these poor people deserve to be drowned). 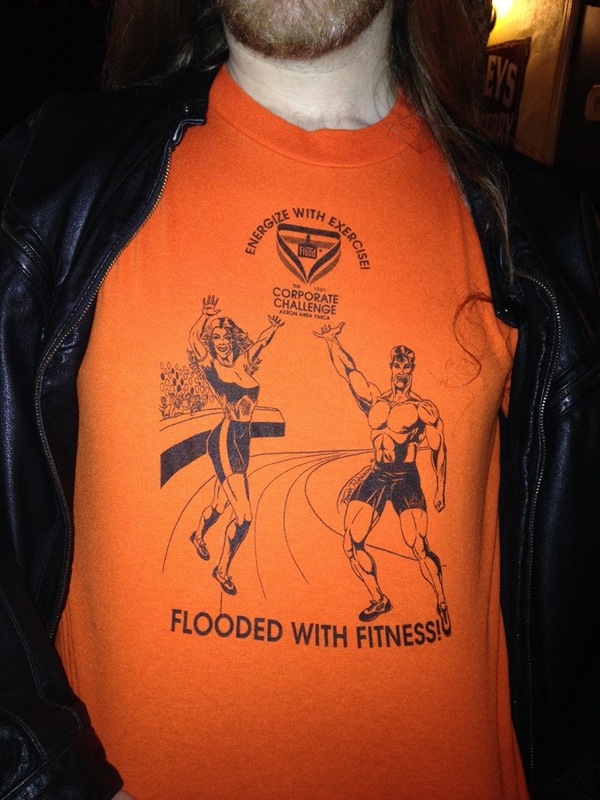 And what with these slogans… Energize with exercise… flooded with fitness…. flooded… drown… yeah. Halloween t-shirt for sure!! Corporate America can be rather a nightmare! I work out next to guys with thighs like that. His left forearm, however, is pitiful; no development in the carpal flexors. What I can’t understand is what exactly they are standing on, and why her chin goes off to one side. Haha! I knew you would have some proper anatomical knowledge on what is wrong with these two! They appear to be floating in space, perhaps on a cloud of endorphins. I just looked again – the male looks to be drooling blood! Oh that explains why they are floating in space then, they’re vampires. Thats a…. no, I wouldn’t wear it! Not even to fitness — not that i fitness. Can you imagine that an entire company’s staff had to wear this hideous thing for a whole day? In public? How odd, I had to approve this comment! You’ve been making changes again haven’t you? HAHA. YES. xD I’m sorry.